By Dr. Jason Lemieux, Chiropractor, Physiomed Oakville As more and more courses begin to open, most golfers are getting the itch to get out and start swinging. You’ve had your shafts re-gripped and shoes re-spiked. You may have even picked up a new HIGH MOI driver at a great off-season sale. But what have you done to get your body ready to shake off the last few months of winter-imposed rust? Most people think that golf fitness programs are only for low handicappers looking to take their game to the next level. In fact, the right fitness program will benefit any golfer, from those starting their first season of recreational golf to veterans of the game. The start of the season is a great time to get back to fundamentals such as address posture. Golf professionals often comment that recreational players lack a sound posture at address. If you observe your swing from down the target line, is your spine athletic and straight, or is it slouched and flexed? The problem with poor address posture is that the body will always take the path of least resistance as you create movement. If you don’t have mobility in your hips and upper back, while lacking stability in your lower spine, then as you bend forward to address the ball, you will lock your hips and bend from your low back. Not only is that a non-athletic posture for golf, it is an express ticket to low back pain in life. You can screen this movement pattern fault by placing a club or dowel behind your back, so that it touches your head, spine between the shoulders, and your tailbone. Now start to bend forward as if to address the ball. What happened? Did your head come off the shaft? Did the shaft come off your tailbone? If so, you’re in need of a proper fitness program. 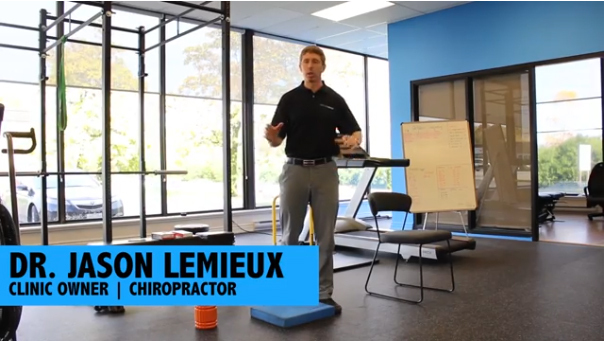 To fix this address posture fault you need to balance two key fitness concepts: stability and mobility. To start, focus on mobility of the hip. Hip mobility at address can be improved by stretching the hamstrings and glutes. To properly stretch the hamstrings for your golf swing, place the club or dowel on your spine as you did above. Take a small step forward, or place your foot on a low step or bench. Slowly bend forward maintaining neutral spine with help from the club. You’ll be amazed at how little you have to bend forward to achieve a big stretch on the hamstrings and calves. To stretch the glutes, lie on your back, or sit comfortably and place your right foot on your left knee. Gently bring the left leg towards your chest, feeling a stretch through the back of your right hip. Hold for 10 to 15 seconds and repeat on the left side. Results can be seen even faster if you free up the muscles in the hips from knots or tension by using a foam roller. Foam rollers can easily be thrown in the trunk of your car and used at the golf course before your round to loosen up the hips and upper back in as little as 30 seconds to a minute. Whether you are a serious golfer or just out for a friendly round, do not overlook fitness as it relates to your sport of choice. You’ll play more consistent, pain free golf for many years to come. For more golf health tips and an individual golf health assessment, contact your nearest Physiomed clinic.